Issue edited by Prue Vines (University of New South Wales) and Robyn Carroll (University of Western Australia). What is the place of apology in law? What is the meaning of apology in a complex landscape of meanings based on a socio-legal appreciation of legal concepts? 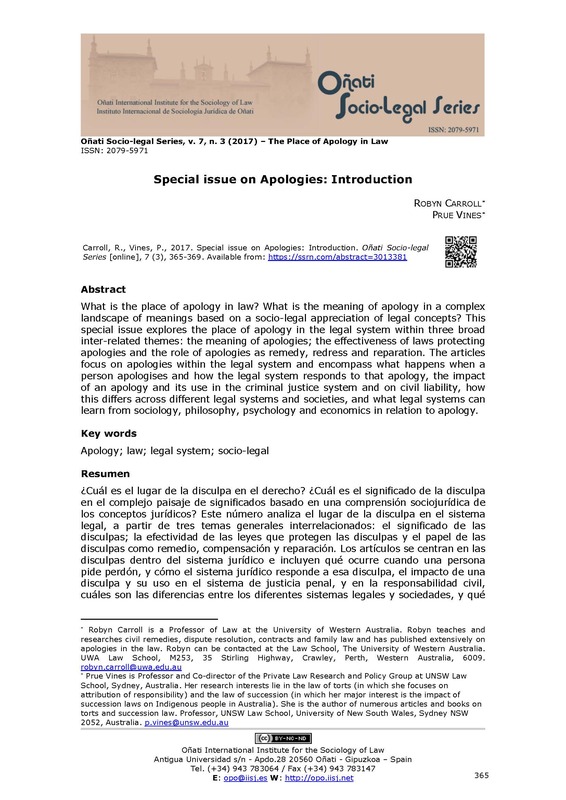 This special issue explores the place of apology in the legal system within three broad inter-related themes: the meaning of apologies; the effectiveness of laws protecting apologies and the role of apologies as remedy, redress and reparation. The articles focus on apologies within the legal system and encompass what happens when a person apologises and how the legal system responds to that apology, the impact of an apology and its use in the criminal justice system and on civil liability, how this differs across different legal systems and societies, and what legal systems can learn from sociology, philosophy, psychology and economics in relation to apology. Apologising is part of civil society and vitally important for maintaining social fabric. Many jurisdictions in Australia, Canada, the USA and UK have enacted apology-protecting legislation in the hope that the process of apologising might reduce civil litigation, particularly litigation about medical negligence. The apology is also significant in restorative justice and may operate in mediation or as a remedy. This article focuses on how the social and psychological process of apologising and being apologised to is affected by the moral communities within which the apology takes place. It argues that the failure to take this process seriously may impact adversely on the achievement of the aims of restorative justice and the apology protecting laws. Apologies have become an accepted feature in many fields of law and there is evidence that they make a constructive contribution to the resolution of disputes. The reason for this might be that they address the intangible needs of parties after adverse events that law otherwise find difficult to address. Legal reformers introduced apologies into law primarily on the basis of deductive reasoning without being able to refer to a comprehensive psychological theory that explains the apology process; in part because apology was only identified as a psychological construct worthy of empirical research during the last quarter of the 20th century. Researchers’ contributions since the 1980s greatly improved the knowledge base about the apology process and we reviewed the relevant literature to find a comprehensive integrated theory of apology that legal reformers and practitioners can use to understand and predict the apology process. We could not find such a theory, but we try to integrate the empirical findings regarding interpersonal apologies into a rudimentary explanation that we believe could assist them. We conclude that apologies will generally be a part of the negotiated corrective interaction between the parties and that legislation should accommodate the process without being overly prescriptive and that lawyers should therefore refrain from judging the apologies their clients offer or accept. This study examined perceptions of partial apologies. Eighty young people rated the extent to which five components of apology (i.e., accepting responsibility, acknowledging harm, expressing remorse, offering reparation, and promising forbearance) implied each other. Statistical analyses across different types of partial apologies showed no significant differences in the extent to which a particular uncommunicated component of apology was implied by one type of partial apology than another. Analyses within each type of partial apology revealed significant differences in the extent to a partial apology implied one type of uncommunicated component than another: Acknowledging harm or offering reparation implied promising forbearance to a lesser extent than accepting responsibility and expressing remorse. Expressing remorse or promising forbearance implied accepting responsibility to a greater extent than acknowledging harm and offering reparation. It is important to understand perceptions of partial apologies because they are more prevalent than full apologies, and may be considered less effective. Apology scholars and researchers in psychology, law, and justice commonly conceptualise the corrective process that follows wrongful behaviour as an apology-followed-by-forgiveness sequence. In this paper, however, we suggest on the basis of our analysis of the research literature that a more suitable conceptualisation of the corrective process is one that includes the acceptance of an apology as an additional discrete step that is distinct from forgiveness. We begin with a brief discussion of the psychological view of apologies as a process of negotiation between offending and offended parties, and how psychologists conceive peoples’ responses to apologies. We also review the psychological literature to determine how psychologists define the acceptance of an apology and how they view it within the corrective process. We then briefly examine how the outcome of forgiveness is commonly used as a restorative ideal in the context of restorative justice conferencing and suggest that assessing instead the acceptance of an apology may be more appropriate in this setting. We conclude the paper with a brief agenda for further research. Apology has many benefits to offenders and victims. The last 15 years have produced worthwhile quantitative and qualitative studies that have refined our understanding of apology, but have also identified the diversity in what can be said in apology and how it can be received. The apology literature in the last 15 years in social psychology, criminology, and criminal justice is examined, including two and three-way interaction effects and qualitative results that focus on the effectiveness of apology at the contextual and individual levels, and the important role that emotion can play. It is recommended that apology be implemented with a “less is more” approach for apology to be most effective for youth in juvenile justice; and that a venue is provided for a spontaneous/voluntary apology to occur, or a minimally prepared apology, using only broad prescriptions on how it ought to be carried out. By utilizing appropriate research strategies, knowledge about apology and its effectiveness in legal settings including juvenile justice can continue to build to determine what type of apology works best for whom under what circumstances. The year 2016 was a milestone for the law-and-apology field, marking the thirtieth anniversary of the first general law aimed at enabling apologies for civil wrongs, introduced in Massachusetts in 1986, as well as the tenth anniversary of the Apology Act, enacted in British Columbia in 2006. The Apology Act seeks to promote apologies and apologetic discourse as an important form of out-of-court dispute resolution, chiefly by making apologetic statements inadmissible for proving liability in civil wrongs. It has served as a benchmark from which subsequent law reform efforts in Canada and abroad have been measured. In 2017, that benchmark was passed with the enactment in Hong Kong of the most ambitious apology law yet, which privileges not only statements of remorse, but also statements of facts embedded in apologies. This article summarises global apology legislation and court decisions to date. Part I considers each major jurisdiction, starting with the USA and concluding with Hong Kong. Part II draws some conclusions about where we have been and where we are going in our efforts to promote or protect apologetic discourse, including recommendations on interpreting existing laws and on drafting or redrafting apology legislation. Although in the Netherlands, like in many other jurisdictions, healthcare providers are expected to be open and honest to their patients and to apologise for any medical mistakes, in practice they are still not always completely open about mistakes that have been made. It is often assumed that healthcare providers’ liability insurers do not allow them to apologise, and indeed that making certain statements, such as offering apologies, can constitute an admission of liability. This assumption is one of the reasons why literature has suggested that it is sensible, from a legal perspective, to exercise caution when offering apologies. This paper argues that this suggestion is both socially undesirable and not substantiated in law. This paper deals with the Spanish provisions in criminal law requesting apology by offenders in organized crime, including terrorism. In order to grant parole, apology is required, among other possible means provided by law, to accredit the abandonment of the ends and means of the terrorist activity. Those legal provisions will be contrasted with the experience and narratives of victims and offenders in cases of terrorism. Final conclusions will be derived in relation to the possibility of restorative apologies in these contexts. The law has historically granted damages for some forms of non-pecuniary losses. In doing so, courts have freely admitted that there is imprecision in quantifying such losses and that there is no quantitative and objective calculus on pain and suffering. Against this background, new research on how hedonic losses are experienced by a victim provide an opportunity to review how non-pecuniary losses should be compensated. Some of this research suggests that experiences of anxiety, frustration and suffering may not affect a victim’s happiness as great as is presupposed in current models of compensation, and further, that its impact may also be ameliorated by the offering of an apology. In this essay, the author asks whether the law can incentivize tortfeasors to offer an apology as an element in mitigating compensatory damages for non-pecuniary loss. This essay explores the justifications for offering amends to victims of lawfully caused harm and the nature of amends in such contexts. In particular, we examine instances in which a state actor commits a grave, but lawful, harm to another, exploring why and how the state ought to respond to victims of lawful harm. This aspect of harm doing is often overlooked, but directly addressing the lawful harm that states cause is a vital part of an appropriate state response to having caused grave, though lawful, harm. First, we explore some general reasons why making amends is a morally appropriate response to lawful harm doing. Second, having justified why states ought to respond to the lawful harm they create, we move to outline a set of appropriate responses. These responses are grounded in the empirical literature on amends and apology and satisfy a number of the moral reasons it may be appropriate for states to offer amends. We offer some specific suggestions for managing amends in the military and police settings, though the basic elements of our proposal might also help inform response to the wider spectrum of lawful harms imposed by the state. Mediation is a process that provides opportunities for parties to civil disputes to engage in dialogue that can satisfy their expectations and needs for apologies. While the literature on law and apology identifies why and ways in which the process can be beneficial, there are concerns associated with apologies offered in mediation. This article provides an overview of the apology and mediation literature in which these benefits and concerns are explored and the psychological research that reveals the complexity of apologies. We use case examples that illustrate this complexity and indicate ways that mediators working with parties in mediation who have indicated that apologies are important to them, might work with this. The article also reflects on the ways that the law interacts with apologies in the mediation of private law disputes and concludes that the law plays a significant indirect role in supporting parties who seek an apology as an outcome of mediation.